We understand that the thought of anaesthetising your pet can be daunting. Every patient is dealt with as an individual and a specific anaesthetic and pain management is created for each patient taking into account species, breed, age, health issues, surgical risks and many other factors. This means we can help minimise the risks to your beloved pet. All our nurses are fully trained and qualified and there is one on one care of your pet for the entire anaesthetic and recovery period. Constant monitoring is essential and factors like temperature, heart rate, blood pressure and breathing rate are all recorded. All anaesthetic patients are monitored with one of our three Bionet monitoring systems. 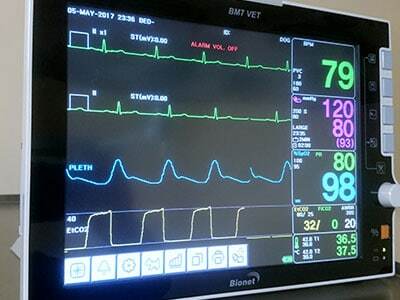 These state of the art monitors provide constant blood pressure, ECG, blood oxygenation, inspired/expired carbon dioxide, temperature and heart rate monitoring. This means any changes are picked up early and allow them to be dealt with before they become more significant. All patients are maintained on a Mistral hot air support mattress. This provides reduced pressure points which leads to a lower risk of clot formation during surgery. As warm air is constantly circulated around your pet it also maintains body temperature. Hypothermia is a real risk during anaesthesia and can have significant ongoing effects in terms of healing rates and bleeding times. In most patients over 5kg we also use the Darveall system which measures the internal body temperature and then warms the breathed in air to the right degree to maintain the best temperature. Once your pet is fully awake and the nursing team is comfortable with their pain management they will then be moved back to their own bed to carry on resting. Once in the hospital ward they are still monitored closely. All of the systems we have in place help to significantly reduce the risk of complications (including infection rates) for your pet and make sure we get the best outcomes possible.